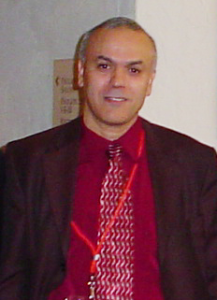 I have known Dr. Djamel Bouchaffra through his publications in journals since 1993. He has made important contributions in the research area of pattern recognition, in general, and handwriting recognition, in particular. Dr. Bouchaffra has published several papers in journals and peer-reviewed conference proceedings. In particular, his papers have been published in the premier journal of our field, IEEE Transactions on Pattern Analysis and Machine Intelligence and in the premier conference in our filed, IEEE Computer Vision and Pattern Recognition (CVPR). I was the session chair at one of his CVPR presentations. His presentation was well received by the audience. This work is a significant contribution that advanced the handwritten digit recognition research for the specific domain of postal zip code recognition. I am pleased to see that he has papers submitted to PAMI and CVPR this year. I am also pleased to note his interest in the fusion of statistics and syntax in pattern recognition. This approach, if widely accepted, would have many applications. Doctor Bouchaffra is a very active researcher who has brought a great deal of enthusiasm, experience and know-how to the state-of-the-art. His knowledge of pattern recognition and image vision algorithms and techniques is outstanding. Prof. Bouchaffra is an expert in statistical and mathematical modeling as well as, learning machines, artificial intelligence and soft computing. His has developed mathematical models that are capable to: (i) represent optimally structural patterns, (ii) decide under uncertainty, and (iii) classify these complex patterns. His areas of application involve speech/handwriting recognition, language modelling, data mining, and bioinformatics. Prof. Bouchaffra has introduced the concept of (SHMM) which extends the traditional HMM's by allowing structural information to be created and accounted for. He successfully applied SHMM's in handwritten numeral recognition, where they have outperformed traditional HMM's. He has also applied to mining customer's preferences for automobile designs. The goal is to build a model that aids engineers in their automobile designs. Two papers that show the role of SHMM's in pattern recognition have just been accepted for publication in: The Journal of Pattern Recognition and in: The International Journal of Data Mining and Knowledge Discovery. These two journals are considered premier in their fields. He has also developed an efficient algorithm that combines expectation-maximization with genetic algorithms. This paper has been published in IEEE PAMI, which is also premier journal in the field. He has published 3 peer-reviewed conference papers; one of them was amongst the best paper award. Prof. Bouchaffra has also introduced the concept of functional set theory (FST) in which preliminary results have been published in the proceedings of ANNIE'2005 Conference. He is also working on statistical language modeling where he has merged statistics with logic to solve the n-grams sparseness problem. This work has been published in the Journal of Pattern Recognition. I have had a unique opportunity to be both a student in one of Dr. Bouchaffra's courses (a graduate course in applied pattern recognition) and a colleague. I received my Ph.D. from Oakland University in 2003 and successively joined the faculty. Dr. Bouchaffra is an excellent teacher and is always willing to provide help to students who need it and go further in depth on topics fro students who are interested in learning more. Dr. Bouchaffra and I have also had several research-related discussions over the past three years about new pattern recognition techniques and their potential applications to biological problems and implementation in embedded systems. Dr. Bouchaffra is not only well-versed in computer science, but he also has an extremely solid theoretical background which enables him to quickly take problems to very abstract, fundamental levels and consider new theories from which solutions could be derived. Dr. Bouchaffra has a high capacity and talent for forming and solving theoretical conjectures using complex mathematics for applications in computer science. It has been a pleasure to take Dr. Bouchaffra's course and work with Dr. Bouchaffra. The entire research spectrum of Djamel Bouchaffra represents a rich scientific production with multiple publications in premier journals, and prestigious international conferences. His current activities in machine learning and pattern recognition are considered advanced; they continue to flourish through his collaboration with laboratories in France and abroad. The volume and the level of publications carried out by Djamel Bouchaffra demonstrate his high qualities as a researcher. Moreover, his activity as a supervisor of young researchers (master sand Ph.Ds) is real and of a very high scientific level. Dr. Djamel Bouchaffra, a brilliant man whom I truly admire. Without his advice and support, my master thesis would not have been possible. I have known Dr. Bouchaffra since 2001. In my first day at Oakland University, we had a discussion in his office. He impressed me so much that I chose to become his Ph.D. student. It proved later that I made the right choice. During the five years I worked with Dr. Bouchaffra, he demonstrated an amazing ability of expressing his idea in both a mathematical way which often involves profound thinking, and an intuitional way which makes things easy to understand. He always enlightened me with solutions when I was facing some hard topics. For example, when he built the structural Hidden Markov Model, he used very complex math equations to describe models that are confusing due to their covered nature. Whenever I felt it was difficult to implement some part of the model, he would write down equations to show every single step of the derivation so that I could easily target the problem. His ability is reflected by not only how he trains a researcher, but also the achievement he made in his own research. Dr. Bouchaffra is also nice to both his co-workers and students. He's not a person who always shows a solemn face. Instead, he likes to work in an environment that everyone feels relaxed and is willing to share ideas freely. Sometimes he sat with me and other researchers in a small café near the university. While enjoying the coffee, we discussed our research topics, sometimes debating, sometimes agreeing with each other. Everybody liked this atmosphere and we often got inspirations happily. I also took several courses that Dr. Bouchaffra taught at Oakland University, such as soft computing, statistical pattern recognition, etc. One of his teaching methods was like this. In the class, he showed some interesting result or phenomenon. After arousing the students' interests, he showed how to make it or how it happens, which made students understand the basic idea. Then he would go deeper and reveal the underlying theories. He was liked by so many students that he was awarded two teaching excellence awards at Oakland University in 2004. He's definitely one of the most instructive teachers that I've seen. After I graduated and got my degree, I still continue to learn things from him through our regular interaction. As a colleague of Dr. Bouchaffra in the Mathematics and Computer Science Department, I have been impressed by Dr. Bouchaffra’s dedication to teaching and research at Grambling State University. Through our informative conversations, he has shown to that he has developed useful strategies to reach all students and research groups in an effective and efficient manner. A very good feedback from both the student body and the rest of the faculty confirms that his teaching strategies and group management are indeed working. In addition, during our faculty meetings he is always knowledgeable and innovative, in particular about enhancing our department curriculum. [...] As for his research, his numerous publications in high quality academic journals and conferences are impressive on their own. Recently, with the other members of the computer science faculty, we have been collaborating on a cross-area project. He has been instrumental in both building the conceptual grounds for the project and planning long-term practical aspects.